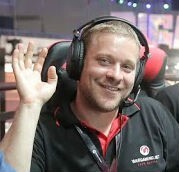 Interview: What was it like to stream live from gamescom? For gamescom 2015, we had a new idea - why not invite three of your favourite community contributors to livestream the event? We set them up with a special Streaming Station on a balcony high-above the Wargaming booth. What was the biggest challenge in streaming the event? It’s a completely new environment, when you’re streaming at home you’re sat in your usual chair, playing with the same keyboard and mouse that you are used to. On the first day, I really felt the challenge. At home, my wife, Tanya, might make a little noise playing a game or something, but in the Wargaming booth it’s really loud. Part of the challenge is adjusting your voice levels for the audience. Do you have a favourite moment from streaming gamescom 2015? It’s got to be when I received permission to stream myself playing the Rheinmetall Skorpion - a German, Tier VIII PremiumTank Destroyer that I didn’t even know existed in World of Tanks PC. Thank you to the Wargaming guys for letting me show that to my viewers. It’s a great tank and I can’t wait to show it off more! Were there any funny mishaps or mistakes? I was streaming a live feed of the Wargaming Stage Show with all the dancers doing their thing. But I quickly realised we had a problem - I couldn’t get the audio from it! I had to think of a way to liven it up for the viewers. So what I did was superimpose my face onto the dancers so they were dancing around with my head instead. You also got to go on stage at one point and play World of Tanks in front of a live crowd. What was that like? I got one-shot by artillery twice in a row…but my main impression of being on stage was the unbelievable hype and energy that you get from the audience especially when doing the live giveaways. Any advice for other people streaming from a live event? Any essential items that they should bring? My voice is a little bit hoarse at the moment so throat sweets would be good! Any final words about your time at gamescom 2015? Everyone has been so nice and so respectful. Meeting my audience is the most amazing thing for me because they are so respectful and humble - it’s just a pleasure to meet all of them. You realise they’re gamers just like you and we’re all together in this. Have you streamed at a live event before? If so, how was gamescom 2015? Yes, I once streamed a live commentary of a game being played at an event but this was very different. I think the biggest challenge for me was having to overcome all the noise with my voice. At first, I was not really able to hear myself and was not sure if I was screaming too loud at the people watching my stream. The time you get to recover your voice each night is also very short. What are your favourite moments from streaming at gamescom 2015? It’s actually sort of a funny one but my favourite moment was on the first day when I set everything up and it just…worked! That was a big relief for me because I hate to fix technical problems! What did you do on the stream? I played games and gave out the prizes that I had for my viewers. It turned out to be quite like a home stream, just in a very different area! You and the streamers had two cameras to stream with, right? Yes, we had two webcams – one for our face and one that was directed towards the crowd. Some people were even watching the stream from below and waving their arms to be on camera. Any advice for other people streaming from a live event? Drink something to keep your throat as happy as possible and you may discover the need to avoid drinking too much alcohol for the same reasons. Normally I’m streaming alone in my house! Here I have to stream with all that is going on in the background, like Wargaming staff working and moving behind you. Sometimes the other guys, gRuMM3L and QuickyBaby, might make you jump as well, like when they shout out or laugh on their streams. 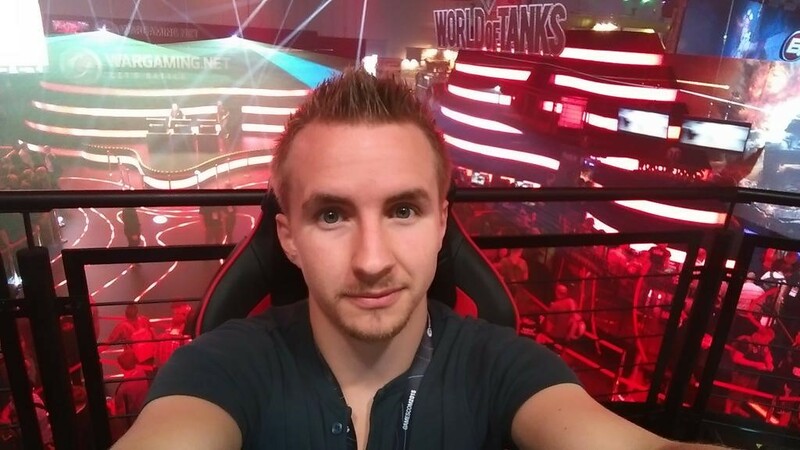 What was your favourite thing that happened while you were streaming at gamescom 2015? It was definitely my interaction with gRuMM3L who was streaming next to me. We tried out playing each other’s games. He, as a World of Tanks PC player, got to try out XBOX and vice versa. It was so funny! This amazing chance to combine two streams is something I could only have really done at gamescom. Oh, it was amazing when Ectar (Wargaming EU Community Manager) took over QuickyBaby’s livestream while he was on a break. Not only did he have fun with QuickyBaby but he moved my stage camera so it was pointing up at the ceiling of the hall! I streamed for maybe 15 minutes then saw the chat going crazy with people saying: “What’s wrong with the camera?” That’s when I noticed! 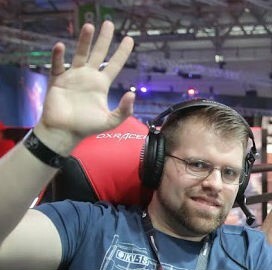 Any advice for other people streaming from a live event like gamescom? As a console gamer, it’s not so simple! You need specific hardware to connect your XBOX to the PC that you are using to stream. My advice would be to bring the set-up that you are used to at home. You do not want to have to learn how new equipment works while you are at an event. The other thing you should bring is a USB stick with all of the ideas you have for your streams. At gamescom we were streaming for 5 days so it was great to be prepared with ideas to keep it all fresh. Thanks to all three streamers for agreeing to interview. We hope you caught the livestreams from gamescom 2015 – we’d love to hear what you thought about this new way of keeping up with the action!